Last month KUDOS was delighted and privileged to attend Danielle Brown’s ‘Becoming a Better Archer’ presentation to members of local archery clubs in Chorley, Lancashire. Danielle – a Paralympic and archery legend turned motivational speaker and KUDOS ambassador – uses her raft of incredible experiences to illustrate what it takes to become the best. Success in any walk of life cannot be achieved without a positive and winning mentality, and Danielle’s outstanding career in archery has enabled her to understand exactly what is required to flourish under pressure. Danielle’s glittering career saw her take gold in successive Paralympic Games as well as three World Championships, break world records galore, and in 2010 she became the first disabled athlete to represent her country in an able-bodied event – winning a gold medal in the team event, naturally. Danielle has had a lifetime of overcoming adversity, and in 2013 she suffered a devastating setback. Fully committed to preparing for and competing at Rio 2106, Danielle’s world was suddenly turned upside down when she discovered new rules meant she no longer qualified to compete in Paralympic events, and with that her archery career was over. Now Danielle has moved on to a new challenge, and – to nobody’s surprise – is proving as much of a success as she had been in archery. She now helps others to achieve their goals through motivational speaking, sport psychology sessions and presentations. And it’s not just sport – the content of Danielle’s inspiring sessions can be applied to business, education and other aspects of life. She can help you negate the impact of stress and nerves, to prepare well and to perform even better. While we wouldn’t want to give away all of Danielle’s secrets here, part of her template for winners is to ‘dress for success’. It is important to wear a team uniform not only at competitions but also at club level. If you’re one of those people who looks at another archer and thinks “Oh my goodness, they look really professional, they must be really good!”, you need to change that. This can only have a negative effect – if you think somebody is better than you, the chances are you are not going to beat them. I’m currently working with KUDOS Sports, who produce fantastic club and team wear. What I like about these guys is they’ve actually taken time out to focus on smaller, lower-profile sports like archery, and produce kit that is specific to us and tailored for us. You need to feel comfortable, you need to look great and for me KUDOS does exactly that. KUDOS specialises in six core sports – archery, netball, hockey, cricket, running and athletics. We work on the basis that every sport is different, and as such the kit requirements and fit must conform to the specific and unique needs of the sport and its participants. We have taken advice from clubs and individuals who participate in the sports, including Danielle Brown, taken heed of what is required from their kit and applied that expertise to our garment models. We are proud to have Danielle on board as an ambassador and look forward to developing and maintaining a fruitful relationship. Keep your eyes peeled for a series of vlogs from Danielle in the not-too-distant future. To find out more about what Danielle has to offer, visit her website. KUDOS is actively and passionately committed to supporting and encouraging people from all backgrounds to get into archery at any level. 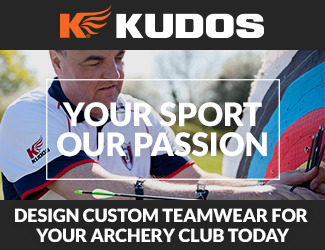 KUDOS is proud to supply custom archery kit to Archery GB – archery kit that is built for performance and worn with pride.